The advantage of online banking is that you can pay bills superfast, and your account is automatically credited or debited for each deposit and payment, making it easier to stay on track. Henry ford once quoted that the only real security that a man will have in this world is a reserve of knowledge, experience, and ability, as for me I would also include banking. On daily basis, crime rate increases and numerous scammers and frauders are all over the internet looking for who to ''chop mugu'' (deceive). Today's stroll, I would be briefing you on the 9 surefire ways to secure your GT Bank internet banking account. Getting to know these surefire tips I would be briefing below, I assure you that you can't fall easily to scammers. 1. Never login to your GT Bank internet banking through any link sent to your email, even though those links are sent from GT Bank, don't access it through your email. Reason for this first tip is that, they are so many deadly scammers that do customise phishing websites that may look exactly like GT Bank webite, so whenever you fall into their scam and login to their sites that the link was sent via email, then you' ve automatically sent them your login details which they would use to operate your GT Bank account. So always login to GT bank direct website and never use any backlink to login. 2. Whenever a secured connection is made, make sure that the begining of your internet banking address would from "http" to "https". 4. Try to subscribe for their sms alert so that you would be aware of any transaction that is done with your GT Bank internet banking and don't hesitate to contact them once you notice any un-authorized transaction being operated in your account. 5. Don't fall for fraudsters that tries to trick you in the name of real payment. Just keep your details secured. 6. Try to also keep your contact and other vital detail up-to-date with GT bank internet banking in other to recieve sms alerts on your mobile device. 7. Like I cautioned previously, never expose your full login details to anyone, and take note that GT Bank internet banking would never ask for that. 8. 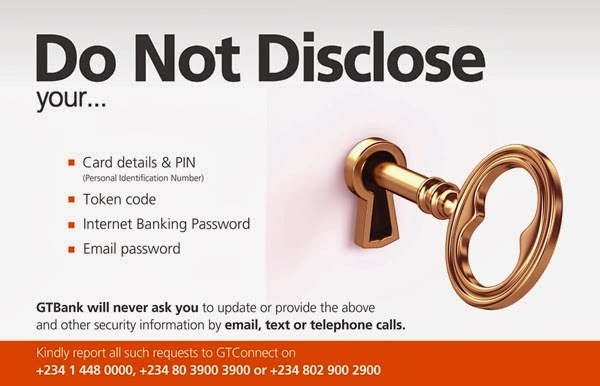 Also take note that whenever you login to GT bank internet banking, make sure that the pages is being encrypted, either by a padlock or unbroken key symbol should appear to signify that you are in their login page. 9. Lastly, GTbank staffs would never call or send you an email for the request of either your card details, generated codes or even your personal identification number (PIN). So never expose any of your personal details to anyone claiming to be GT bank staff.